St. Paul police and the Minnesota Wild are urging hockey fans looking for playoff tickets to be careful if buying them from hawkers on the street or sites like Craigslist. In come cases, fans are sold one legitimate ticket and then numerous copies of the same ticket. That means one fan in a group gets in, but the others have “a piece of paper that is worthless,” Ernster said. 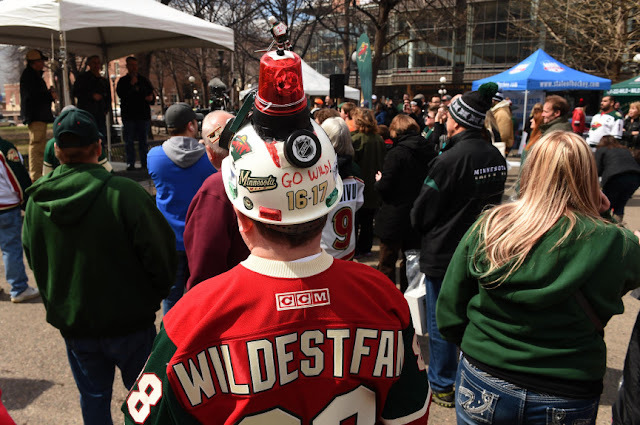 The Wild’s ticket takers didn’t receive any fraudulent tickets for Wednesday’s game, but they expect they could see some as the playoffs go on, said Maria Troje, Wild vice president of fan relations. “As we win more, we could see more and more fraudulent tickets because the number of tickets available to sell are few and far between since season ticket holders bought most of the tickets for home playoff games,” Troje said. Fans can ensure that their tickets are legitimate by buying them from the Wild or Ticketmaster websites, the NHL ticket exchange or the Xcel Energy box office, Troje said. So, yesterday I decided to be a bit of a downer and dropped this article, 5 Reasons the Blues will beat the Wild. Hopefully, it didn’t kill your buzz too much. In case you were worried about me drinking blue Kool-Aid, let me set the record straight: No, I don’t think the Wild will get upset by the Blues in Round 1. Sure, it’s possible. Anything is. But Minnesota has a team that should vanquish their division rival. So, get some optimism in your life and follow along as I give you 5 reasons Minnesota should be able to defeat St. Louis and move onto the second round. One of the most impressive things about St. Louis’ recent run to the playoffs is that they’ve done it while sustaining some big injuries. Robby Fabbri has been out since February with an ACL tear, while Paul Stastny is week-to-week with a lower-body injury and no definite timetable to return. Those injuries hurt a team that already had issues getting consistent offense past Vladimir Tarasenko’s line. Meanwhile, Minnesota possesses an impressive amount of depth at forward, particularly down the middle. They can boast Mikko Koivu, Eric Staal, Martin Hanzal, Joel Eriksson Ek, and even Erik Haula and Charlie Coyle as players who can play the pivot. Compare that to the Blues, who recently have had to use Alex Steen at center. For a visual on how Minnesota matches up with St. Louis up front, I looked at likely Game 1 lines (for reference, here’s MIN and STL’s lines), and compared how many goals per game each line scored this season. Not the most scientific measurement, but you’ll get the idea. The Wild can do better. We mentioned yesterday that St. Louis’ defense has been quite good, allowing the second-fewest scoring chances in the NHL. We did not mention that Minnesota was the only team to concede fewer scoring chances than the Blues. Minnesota’s blue line was extraordinary at protecting their net this season. At 5-on-5, Jonas Brodin, Ryan Suter, Jared Spurgeon, and Matt Dumba all allowed fewer than 6 scoring chances per hour. Even Marco Scandella, their worst regular defenseman, only gave up 6.66 scoring chances per hour. For context, that’s slightly better than 4th-place Boston (6.73). Not to mention the fact Minnesota has defensive stalwarts in Koivu, Hanzal, and Nino Niederreiter at forward. Earlier in the season, the Wild would protect their net, but at the cost of allowing shots from the perimeter. But since acquiring Hanzal, they’re not even letting teams get those chances off. Minnesota’s been best in the league at suppressing shot attempts during that time, while improving their already-great scoring chance numbers. St. Louis’ identity revolves around their defense, but Minnesota has the players and system to beat the Blues at their own game. Another big difference between the Wild and Blues is that Minnesota is able to convert their sterling defense into offensive opportunities. Spurgeon is the best defender at this, thanks to his ability to make a great outlet pass, but Suter, Brodin, and Dumba are also good in transition. But the secret to the Wild’s success here is their forwards. They’ve got speed up front with Granlund, Zucker, Haula, and Coyle. With that combination of speed, smarts, and opportunism, the Wild are able to recover the puck in the neutral and defensive zones and start a rush the opposite way. This is going to put a ton of pressure on St. Louis to play a flawless game. Zucker and Granlund in particular are able to find, create, and exploit even small cracks in defensive schemes. Combine that with sizable players who can grind opponents down, and the Blues’ vaunted defense will have their hands full containing Minnesota’s multi-faceted attack. Jake Allen has absolutely torched the NHL since February. But Allen’s game hasn’t been without it’s ups and downs. Through January, Allen was one of the very worst goaltenders in the league, despite playing behind a great defense. It took him new voices from head coach Mike Yeo and goalie coach Martin Brodeur for him to pull out of that funk. And that’s fine- sometimes people need new voices to succeed. But it does show an instance where Allen seemed to have a tough time shaking off a bad stretch. Another example came 2 years ago in the playoffs. Few will remember that Allen was absolutely great against Minnesota in the first 4 games of the series. He posted a .935 save percentage, losing twice only because of poor goal support from his team. But then Game 5 happened, and Allen allowed 4 goals on just 19 shots. Then-coach Ken Hitchcock put him in net for Game 6, and he allowed the first point- a bad-angle short-handed goal to Zach Parise. Hitchcock trusted Allen to recover. In this hilarious (well, if you’re a Wild fan) sequence, you’ll see Hitchcock giving Allen a vote of confidence in an in-game interview. 32 seconds later, Allen fails to make an easy-looking save on Justin Fontaine. It’s perhaps unfair to tag a label like this on a player when we don’t know what’s going on inside their head. But still, until Allen shows he can recover from a bad performance in the playoffs, he’s going to have a reputation for getting rattled. And with players like Parise, Staal, Niederreiter, Zucker, and Jason Pominville being willing to shoot from anywhere, there’ll be chances for Allen to give up those kinds of “bad” goals. But ultimately, I think the biggest reason Minnesota will topple St. Louis is this: They’ve done it before. 1 ) The Wild are better than they were two years ago. Back then, Minnesota didn’t have an MVP-caliber performance from a player like Granlund. They didn’t see an unleashed Niederreiter, Coyle, or Zucker. They didn’t have four lines that could score. And they sure didn’t have the size at center they enjoy today with Staal and Hanzal. In every way, this is a deeper, better team. 2 ) The Blues are worse than they were two years ago. St. Louis sold off TJ Oshie just months after losing the series to Minnesota. His replacement, Troy Brouwer, is already gone. They then lost their captain and best center David Backes the year after that. Goalie Brian Elliott also was traded this past summer, meaning St. Louis’ fortunes depend entirely on Allen. Power Play quarterback Kevin Shattenkirk left at the trade deadline. Stastny is out- at least for now. And without Fabbri in the lineup, there’s little to replace the value lost by the Blues over the past two seasons. Nothing is a given in the Stanley Cup Playoffs. The Wild will have to not take the Blues lightly, and Devan Dubnyk must go back to being a reliable goaltender. But Minnesota has both high-end performers and depth, and should be able to power them past St. Louis. The story starts, and it stops with Blues goaltender Jake Allen. And really, he wasn’t god-like in the game as his defense helped him numerous times with bad rebounds and loose pucks that got swept away. But there were some amazing saves by the Blues netminder that took a shelling from the Wild all game long. Zach Parise scored with 23 second left in the game to force overtime, but that was all the Wild could muster past Allen. The first period was scoreless, but the Wild, with a raucous, boisterous, and rowdy crowd of 19,168 behind them, dominated shots, zone time, shot attempts, and just about every category you could think of except the scoreboard. Devan Dubnyk looked good as well in his net for Minnesota. Rip him all you want for the month of March, but he was very good in the game. Jake Allen was just better. The second period, Minnesota was a bit slow to come out of the locker room, and when Vladimir Sobotka scored to put the Blues up 1-0 at the 6:21 mark of the period, all the Blues needed to do was play stellar defense. The Wild got into some penalty trouble after back-to-back penalties by Christian Folin and Ryan Suter. But Minnesota killed both penalties off and caught a bit of momentum. They threw everything and the kitchen sink at Jake Allen. Allen absolutely stone-cold robbed Charlie Coyle on a point-blank shot. Another time, it looked like the Wild were finally going to get one past Allen when the puck got behind a sprawling Allen and the puck slowly trickling towards the gaping net. But Nino Niederreiter and Parise both lunged for a stab at the puck, except Parise caught the wrong side of the puck and kicked out to the slot. Minnesota out-shot the Blues 16-6 in the period. The Wild got an early power play to start the 3rd period, but couldn’t capitalize. In fact, the Wild went 0-for-3 for the night and only generated two shots on goal with the man-advantage. It wasn’t nearly enough chaos created against a goalie that was stopping everything. Dubnyk had to make a humongous left pad save on Vladimir Tarasenko to keep the deficit to one. Tarasenko was held to just a single shot until the 3rd period when he tallied three more. It wasn’t until Bruce Boudreau used his timeout get Dubnyk off the ice, and assistant coach John Anderson to draw up a play. With the extra attacker, Mikael Granlund set up on the half wall and centered to Mikko Koivu in the high slot. Koivu directed the puck towards Parise who was to Allen’s left and scored to tie the game. The X was electric as the final seconds of the period ticked off the clock. St. Louis had defended nearly the entire game. You’d think fatigue was going to set in sooner or later as overtime progressed. The Wild were inches from winning as a mad scramble broke out in front of the Blues net with Allen prone along the goal line. But instead, with 2:12 left in the period and with the legs of the Wild clearly heavy, Tarasenko beat Koivu and when the puck rolled off the blade of his stick, Joel Edmundson, pinching in from the blue line, found nothing but net for the game winning goal. A disappointing result to an otherwise dominant game by the Wild. I’ve said it before this series. I’ve said it on my predictions for the series, and on the podcast, but Mike Yeo’s system will steal wins. The key will be for the Wild to not get frustrated and continue to get a number of shots on net, with a bit more net presence for those rebounds. My guess is that if the Wild can do that, there will be more wins in the Wild’s future. Don’t let the Twitter peeps or other analysts tell you different - the Wild put out a great effort in this game, played hard, and dominated the game. The result just wasn’t there because the goaltender was amazing, and his defense was good at sweeping away rebounds. 0 Response to "Minnesota Wild, police warn against buying fake playoff game tickets"